Home » Unlabelled » List Of Vulnerability & it`s Tutorial. It`s 100th post. When I started to write , I did not think that it may longer this.So today I don`t put any new article about hacking , I am gonna repeat some famous vulnerability which we had seen before. 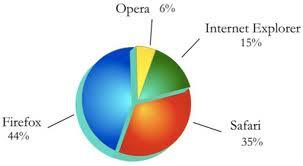 In the chart , you can see that different types of vulnerability & it`s percentage which exists in website. This is web-browser vulnerability . So you can see that which browser is easy to hack. It is a hacking method that allows an unauthorized attacker to access a database server. It is facilitated by a common coding blunder: the program accepts data from a client and executes SQL queries without first validating the client’s input. The attacker is then free to extract,modify, add, or delete content from the database. (2)Howto find & Exploit cross-site scripting? CSRF is an attack which forces an end user to execute unwanted actions on a web application in which he/she is currently authenticated. 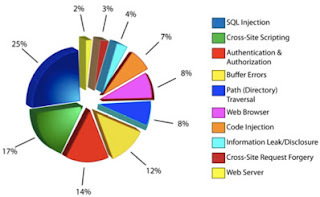 With a little help of social engineering (like sending a link via email/chat), an attacker may force the users of a web application to execute actions of the attacker's choosing. A successful CSRF exploit can compromise end user data and operation in case of normal user. If the targeted end user is the administrator account, this can compromise the entire web application. (1)Howto find & exploit C.S.R.F.? Local File Inclusion (also known as LFI) is the process of including files on a server through the web browser. This vulnerability occurs when a page include is not properly sanitized, and allows directory traversal characters to be injected. spoofing refers tricking or deceiving computer systems or other computer users. This is typically done by hiding one's identity or faking the identity of another user on the Internet. Phishing is the act of attempting to acquire information such as password ,usernames, , and credit card details (and sometimes, indirectly, money) by masquerading as a trustworthy entity.